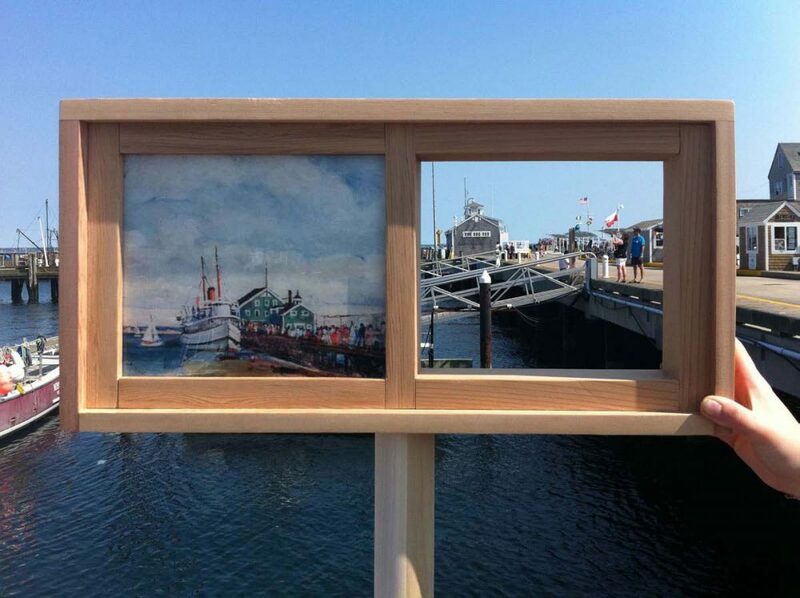 In Provincetown, a series of 25 picture frames set up in various locations is providing a history lesson for residents and visitors. The frames are part of an art installation called "Re[Framing] Provincetown." The project was created by Tsao & McKown Architects for the Provincetown Art Association and Museum (PAAM), which is celebrating its centennial. Each frame is split in half — on one side is a historical photo or painting of the site and on the other side the frame is open to show what the site looks like today. By framing views toward specific sites while simultaneously offering up historic photos or paintings of those sites, there is food for thought about what may have physically changed and how the qualities and character of the places may have changed as a result. On the back of each frame is an invitation for people to share their stories, memories and photographs of a particular site by sending them to PAAM or posting them on social media using #reframingptown. The museum has been collecting those stories since the frames went up in August. On Sept. 26, PAAM debuted part two of the picture frame project using the stories they had already collected. That exhibit is called "Re[Framing] Provincetown: Animating History Through Sharing." At the exhibit, visitors can look through all of the collected documents (a sort of communal scrapbook) and watch historical films about Provincetown. The museum also set up a recording booth to capture people's oral histories. The PAAM exhibit will run through Oct. 26, but the museum will continue collecting stories until the frames are taken down. All of the materials collected through the project will be added to PAAM’s permanent collection. Picture frames seem to be a popular way to get people to re-imagine their surroundings. Earlier this month, we reported on the installation of three large pictures frames in the Boston Public Garden. The Provincetown frames were originally set to come down at the end of this month, but will now remain up through the end of November, according to PAAM. So, there's still plenty of time left to learn a little history about the very tip of Cape Cod.